Paper is not only for writing. You can even make crafts from paper. 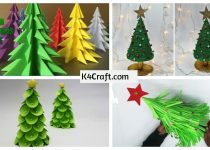 Paper crafts are really beautiful and easy to make. , You can even make different animals from a single sheet of paper. 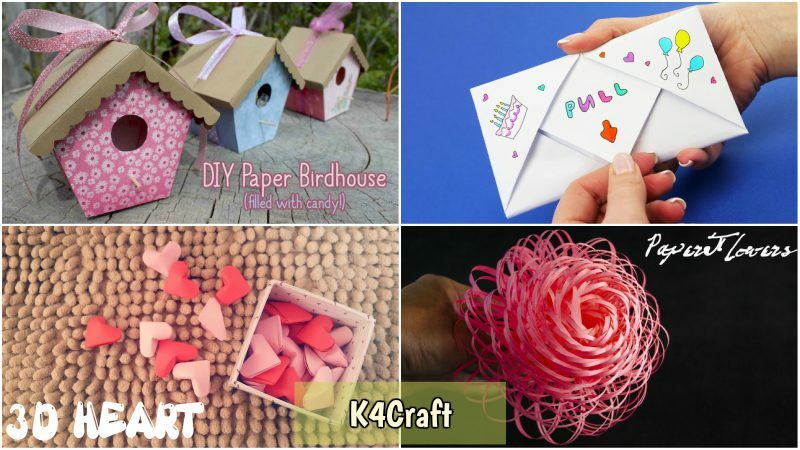 You can even gift this paper crafts to your friends, kids, families and your loved ones. There are many things that you can make from a paper. Here, I am going to tell you some easy paper crafts which you can gift to your loved ones. You can make a pull tab origami easily. You just need a piece of paper and nothing else. Interesting isn’t it? Let’s get started. Fold the paper in half so that you will get a rectangular shape. Unfold it and then on each side make tiny folds in the shape of triangle. That should be total 4 folds, 2 on each side. Now fold on the horizontal sides of the paper and then fold the flaps too. You will get a structure of envelope. On the back side, write a message or you can even doodle. Again fold the paper in half and then insert the flaps in each of the gap. Decorate the envelope as you want. Watch the video for the steps. You can make a small paper birdhouse as a gift for your beloved. You can get the structure of the birdhouse from the internet. Print it out and trace the design on a thick paper and then cut it out. Fold the paper where the dotted lines are marked. Cut out colourful paper accordingly and then paste it on the thick paper. Stick a small note on the centre piece and then fold the thick paper and stick them. For the roof of the birdhouse, cut out a piece of cardboard and fold it in half. Decorate the birdhouse according to your wish. You can even tie a ribbon or decorate with beads. Fill the birdhouse with candies or some snacks. Your diy birdhouse is ready to gift. Watch the video tutorial for more ideas. You can even make a pencil holder from papers. All you need is, some colourful papers and glue. Fold a paper in half. Unfold it and then again fold it from another side so that you will get four small squares in the paper. Fold two mini squares diagonally, so that the flaps would touch at the mid point. Fold the other half again so that you would get the shape of a paper hat. You would see a line crossing at the middle. Fold the two sides of the paper, so that it would touch the middle line. You would get a gap on on side. Insert the other side on the gap, so that you would get the shape of a cone. Secure it with glue. Make many such cones and then start sticking them on each side so that you would get the strictest of a pencil holder. 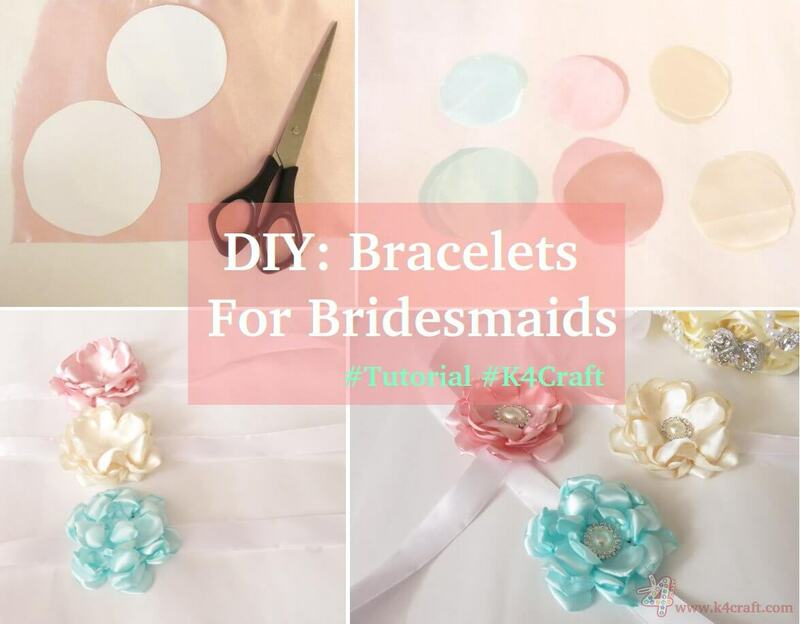 Cut out a circle according to the measurement of the holder and stick it to the base of the holder. Your pencil holder is ready. You can gift it to the kids. Here’s the video representation. For making some fluffy paper flowers, you need some colourful papers and glue. Take a paper and fold it in half. Measure 2inch or less an draw a line. Now cut thin strips of paper upto the line, so that it will look like shredded paper. Take another piece of paper and roll it to make it look like stick. Secure it with glue. Now, stick one end of the shredded paper on the stick and start rolling it. You would get a nice fluffy paper flower. Now secure the paper with tape. You can add another shredded paper to make the flower look more fluffy. Make a bunch of paper flowers and gift it as a bouquet. The advantage of paper flowers is that it won’t ever rott or dry and it would keep reminding the person about you. Here’s the video representation. You can make a honeycomb from paper, as a room decor and gift it too. It’s super easy to make and looks really beautiful. Cut out circles from colourful paper of same radius. Fold the circle in half and then again fold it in half. Take the folded paper and then fold it so that it may look like a cone, the way we did in the pen stand. Unfold the paper and apply glue only on the creased marks shown in the video. Do the same with the remaining circles. Now, stick the circles by applying glue on the remaining marks. You can make many such honeycombs and then gift them as flowers or wall hangings. Just add a stick for making the flower and a thread for the wall hanging. Watch the video for the steps. You can make animals from papers. You just need to have the idea of the folding technique. You can make many such origami animals and then gift it to the kids. You can even give them an origami kit. Take a box, keep a stack of colourful papers and then write down the folding technique for each animal and then wrap it up and gift it. From this technique, the kids won’t only have fun but would also learn this origami technique and make many such origami objects. You can even make this with them. It would be like a fun activity for the kids. In the video below, it is shown how to make an elephant from a sheet of paper. Watch the video for the steps. Origami hearts are really cute and you can put it on the box of the gift that you have to present. It would look really good alongwith your gift. It’s really easy to make. Take a piece of paper, more in length and less in breadth. Now fold the paper at one end in the shape of a triangle. Continue this process until you reach the end of the paper. You would get the shape of a triangle. Don’t cut off the excess. Fold the excess and insert it in the gap of the triangle. Now, cut out the two corners of the triangle and then fold it so that it will look like a 3D heart. You can make as many as you want and then keep it in a box of chocolates or any other gift. Watch the video for steps. There are so many gift ideas for you and that too from paper. You can make a pop-up card, a photo book, a slide through heart card and many more such things. Making a pop-up card is really easy. Take a paper and fold it in half, as a card. Now, trace the design of a heart or any other design. Don’t cut the whole design, leave a little bit. The card is almost ready. Decorate the design and then take another paper of the same measurement of the card. Stick this paper on the card. Your pop-up card is ready. Watch the video for many such ideas. 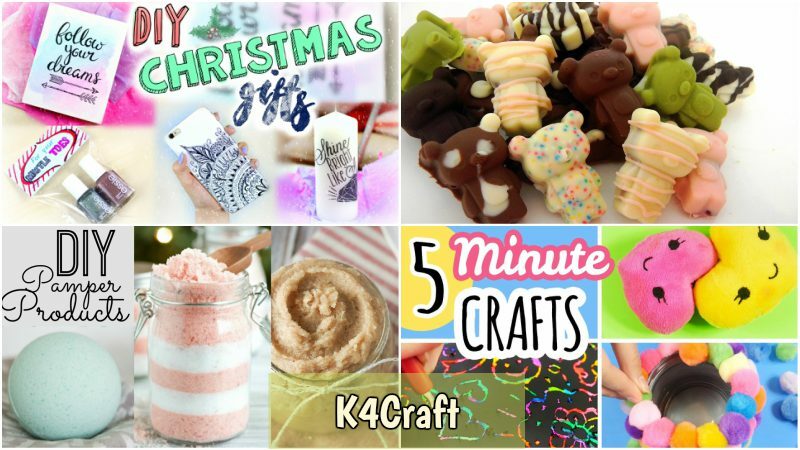 These are some easy gift ideas that you can make from paper. You can make these crafts from used paper too. It would be like recycling old papers into something really beautiful that you can gift it to your beloved. Do try the crafts during this vacation.